Although chemical services are usually best done by a professional cosmetologist, home perms can be a good option when money is tight or you are unable to get to a salon. Instead of paying between $40 and $200 for a salon permanent wave, you can give yourself a perm for the cost of the product, usually under ten dollars. All you need are some simple supplies, a home permanent wave kit, and a few hours of your time. Toni was the first company to introduce a home permanent product during the 1940s. Other companies, such as Rayve and Lilt, also made home perms, which were a breakthrough for women who wanted a permanent wave without the salon price. The Toni perm enjoyed extreme popularity largely because of an advertising campaign that asked "Which Twin has the Toni?" Toni home perms can still be purchased today, along with several other brands. You can find home perm kits in grocery and drug stores, and also in beauty supply stores that sell products to the general public. There are formulas for normal hair, hard-to-curl hair, fine hair, tinted hair, and damaged hair. You can achieve a variety of looks, from tight curls to a body wave, by selecting the proper rod size. Permanent wave rods are what the hair is wrapped around when doing a home perm. The rods come in a variety of sizes; a small diameter rod creates small, tight curls, while large rods produce a loose, wavy look. Rod sizes can also be mixed to give a combination of curl sizes. It takes about three hours to complete a home perm, and they can last as long as a salon perm - about three to four months. Hair gets its texture and characteristics from a complex series of chemical and physical bonds. Permanent wave solution breaks these bonds and allows the hair to take on a new shape. After the bonds in the hair are sufficiently broken down, the solution is rinsed from the hair with water. At this point another solution, called the neutralizer, is applied and left on the hair for about five minutes. The neutralizer re-forms the bonds in the hair to preserve the new curly shape. Home perms are not really "permanent" because the hair grows out from the scalp in its natural pre-perm state. Make sure that your hair is free of conditioner and any build-up of hairspray or styling products. Roll your hair around rods sized appropriately to achieve the curl you want, taking sections no wider than the width of the rod and no thicker than its diameter. End papers should be used on the hair ends of each section to keep the ends smooth. 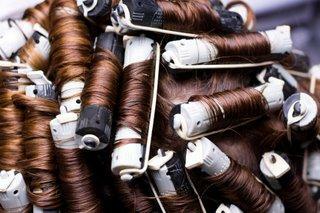 After the hair is completely wrapped around the rods, apply the permanent wave solution to each rod. Cover your head with the plastic cap that comes with the perm kit, and process for the time suggested in the instructions. Rinse the hair with warm water until the perm smell can no longer be detected, usually at least five minutes. Blot the rods with a towel to remove the excess water, and then apply the neutralizer. The neutralizer usually needs to remain on the hair for about five minutes, after which it is rinsed with warm water for another five minutes. Remove the rods, and rinse one final time. Dry and style your hair, but don't shampoo for at least 24-48 hours to allow the bonds in the hair to completely harden in the new curled formation. If you don't have experience with perming your own hair or have damaged or color-treated hair, it might be wise to make an appointment with a cosmetologist in a salon. An experienced cosmetologist will be able to make suggestions regarding the rod size necessary to achieve the type of curl you are looking for, as well as the perm solution that will work best for your hair. A home perm is a chemical, and you can cause your hair to become damaged if you don't use the proper formula and techniques.